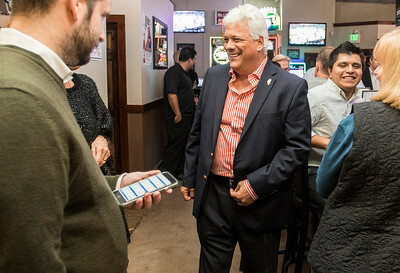 Sarah Nader- snader@shawmedia.com County Board Chairman candidate Jack Franks greets supporters at Offsides in Woodstock while he waits for election results Tuesday, Nov. 8, 2016. 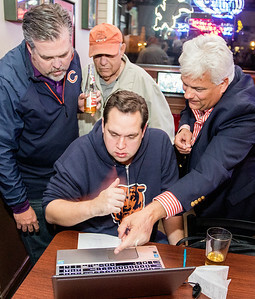 Sarah Nader- snader@shawmedia.com Mike Noonan (left) of Flossmoor Herb Franks of Marengo and County Board Chairman candidate Jack Franks look on as Sean Tenner of Chicago pulls up election results at Offsides in Woodstock Tuesday, Nov. 8, 2016. Mike Noonan (left) of Flossmoor Herb Franks of Marengo and County Board Chairman candidate Jack Franks look on as Sean Tenner of Chicago pulls up election results at Offsides in Woodstock Tuesday, Nov. 8, 2016.